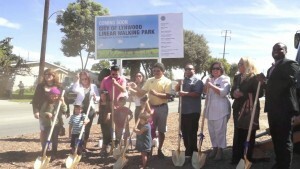 California Consulting Client, City of Lynwood, Uses Grant Money to Build New Park - California Consulting, INC. 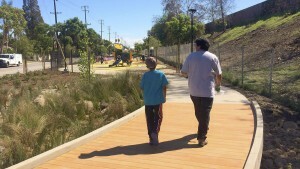 The City of Lynwood was awarded $4.9 million dollars from the State of California’s Parks Competitive Grant Program to specifically build a Linear Walking Trail/ Park along the Fernwood corridor. The linear piece of land for the proposed trail runs perpendicular to the 105 freeway on Fernwood Avenue. The park is between Atlantic Boulevard and Bullis Road which is about a mile long and ranges from 50 to 60 feet wide. Upon receiving the grant in 2012, the City asked residents to help with the design of the new Linear Walking Trail/ Park, to gather suggestions regarding what they would like to see in this new space. The park features include: 1) A small dog park; 2) A community garden with a tool shed and a vegetable wash station; 3) A fitness area; 4) A small playground; 5) Native vegetation; 8) Solar security lighting; 9) Seating opportunities; and 10) Historical signage that tells the history of Lynwood. California Consulting is proud to be a part of this amazing project that helped beautify the Lynwood community. California Consulting is the state’s largest grant writing company. Since 2004, California Consulting has successfully written over 690 grants. Through a combined effort, California Consulting has secured over $1.5 billion dollars for our clients through federal, state, and nonprofit funding avenues.